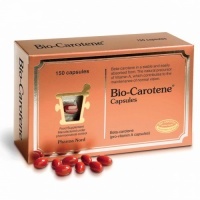 The most common carotenoids include lycopene and the vitamin A precursor β-carotene. In plants, the xanthophyll lutein is the most abundant carotenoid and its role in preventing age-related eye disease is becoming more obvious and is a factor in most eye health supplements. Lutein and the other carotenoid pigments found in mature leaves are often not obvious because of the masking presence of chlorophyll. When chlorophyll is not present, as in young foliage and also dying deciduous foliage (such as autumn leaves), the yellows, reds, and oranges of the carotenoids are predominant. For the same reason, carotenoid colours often predominate in ripe fruit (e.g., oranges, tomatoes, bananas), after being unmasked by the disappearance of chlorophyll. 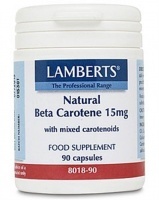 Vitamin A contributes to maintaining normal skin, vision, immune functioning and mucous membranes. Vitamin A activity and antioxidant.